Maximinus Thrax (Latin: Gaius Iulius Verus Maximinus Augustus; c. 173 – May 238), also known as Maximinus I, was Roman Emperor from 235 to 238. A Thraco-Roman of low birth, Maximinus was the commander of the Legio IV Italica when Severus Alexander was assassinated by his own troops in 235. The Praetorian Guard then elected Maximinus emperor. In the year 238 (which came to be known as the Year of the Six Emperors), a senatorial revolt broke out, leading to the successive proclamation of Gordian I, Gordian II, Pupienus, Balbinus and Gordian III as emperors in opposition to Maximinus. Maximinus advanced on Rome to put down the revolt, but was halted at Aquileia, where he was assassinated by disaffected elements of the Legio II Parthica. Maximinus is described by several ancient sources, though none are contemporary except Herodian's Roman History. He was a so-called barracks emperor of the 3rd century; his rule is often considered to mark the beginning of the Crisis of the Third Century. Maximinus was the first emperor who hailed neither from the senatorial class nor from the equestrian class. 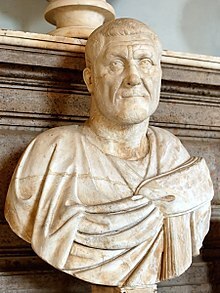 Most likely Maximinus was of Thraco-Roman origin (believed so by Herodian in his writings). According to the notoriously unreliable Augustan History (Historia Augusta), he was born in Thrace or Moesia to a Gothic father and an Alanic mother, an Iranian people of the Scythian-Sarmatian branch; however, the supposed parentage is a highly unlikely anachronism, as the Goths are known to have moved to Thrace from a different place of origin much later in history and their residence in the Danubian area is not otherwise attested until after Maximinus had lived his full life and died. British historian Ronald Syme, writing that "the word 'Gothia' should have sufficed for condemnation" of the passage in the Augustan History, felt that the burden of evidence from Herodian, Syncellus and elsewhere pointed to Maximinus having been born in Moesia. The references to his "Gothic" ancestry might refer to a Thracian Getae origin (the two populations were often confused by later writers, most notably by Jordanes in his Getica), as suggested by the paragraphs describing how "he was singularly beloved by the Getae, moreover, as if he were one of themselves" and how he spoke "almost pure Thracian". His background was, in any case, that of a provincial of low birth, and was seen by the Senate as a barbarian, not even a true Roman, despite Caracalla’s edict granting citizenship to all freeborn inhabitants of the Empire. According to the Augustan History, he was a shepherd and bandit leader before joining the Imperial Roman army, causing historian Brent Shaw to comment that a man who would have been "in other circumstances a Godfather, [...] became emperor of Rome." In many ways, Maximinus was similar to the later Thraco-Roman emperors of the 3rd–5th century (Licinius, Galerius, Aureolus, Leo the Thracian, etc. ), elevating themselves, via a military career, from the condition of a common soldier in one of the Roman legions to the foremost positions of political power. He joined the army during the reign of Septimius Severus, but did not rise to a powerful position until promoted by Alexander Severus. Maximinus was in command of Legio IV Italica, composed of recruits from Pannonia, who were angered by Alexander's payments to the Alemanni and his avoidance of war. The troops, who included the Legio XXII Primigenia, elected the stern Maximinus, killing young Alexander and his mother at Moguntiacum (modern Mainz). The Praetorian Guard acclaimed him emperor, and their choice was grudgingly confirmed by the Senate, who were displeased to have a peasant as emperor. His son Maximus became caesar. Maximinus hated the nobility and was ruthless towards those he suspected of plotting against him. He began by eliminating the close advisors of Alexander. His suspicions may have been justified; two plots against Maximinus were foiled. The first was during a campaign across the Rhine, when a group of officers, supported by influential senators, plotted to destroy a bridge across the river, in order to strand Maximinus in hostile territory. They planned to elect senator Magnus emperor afterwards, but the conspiracy was discovered and the conspirators executed. The second plot involved Mesopotamian archers who were loyal to Alexander. They planned to elevate Quartinus, but their leader Macedo changed sides and murdered Quartinus instead, although this was not enough to save his own life. Maximinus' first campaign was against the Alemanni, whom he defeated despite heavy Roman casualties in a swamp in the Agri Decumates. After the victory, Maximinus took the title Germanicus Maximus, raised his son Maximus to the rank of caesar and princeps iuventutis, and deified his late wife Paulina. Maximinus may have launched a second campaign deep into Germania, defeating a Germanic tribe beyond the Weser in the Battle at the Harzhorn. Securing the German frontier, at least for a while, Maximinus then set up a winter encampment at Sirmium in Pannonia, and from that supply base fought the Dacians and the Sarmatians during the winter of 235–236. Early in 238, in the province of Africa, a treasury official's extortions through false judgments in corrupt courts against some local landowners ignited a full-scale revolt in the province. The landowners armed their clients and their agricultural workers and entered Thysdrus (modern El Djem), where they murdered the offending official and his bodyguards and proclaimed the aged governor of the province, Marcus Antonius Gordianus Sempronianus (Gordian I), and his son, Gordian II, as co-emperors. The Senate in Rome switched allegiance, gave both Gordian and Gordian II the title of Augustus, and set about rousing the provinces in support of the pair. Maximinus, wintering at Sirmium, immediately assembled his army and advanced on Rome, the Pannonian legions leading the way. Meanwhile, in Africa, the revolt had not gone as planned. The province of Africa was bordered on the west by the province of Numidia, whose governor, Capelianus, nursed a long-standing grudge against the Gordians and controlled the only legionary unit (III Augusta) in the area. He marched on Carthage and easily overwhelmed the local militias defending the city. Gordian II was killed in the fighting and, on hearing this, Gordian I hung himself with his belt. Pupienus and Balbinus then became undisputed co-emperors. However, they mistrusted each other, and ultimately both were murdered by the Praetorian Guard, making Gordian III sole surviving Emperor. According to early church historian Eusebius of Caesarea, the Imperial household of Maximinus' predecessor, Alexander, had contained many Christians. Eusebius states that, hating his predecessor's household, Maximinus ordered that the leaders of the churches should be put to death. According to Eusebius, this persecution of 235 sent Hippolytus of Rome and Pope Pontian into exile but other evidence suggests that the persecutions of 235 were local to the provinces where they occurred rather than happening under the direction of the Emperor. "The Romans could bear his barbarities no longer – the way in which he called up informers and incited accusers, invented false offences, killed innocent men, condemned all whoever came to trial, reduced the richest men to utter poverty and never sought money anywhere save in some other's ruin, put many generals and many men of consular rank to death for no offence, carried others about in waggons without food and drink, and kept others in confinement, in short neglected nothing which he thought might prove effectual for cruelty – and, unable to suffer these things longer, they rose against him in revolt." Ancient sources, ranging from the unreliable Historia Augusta to accounts of Herodian, speak of Maximinus as a man of significantly greater size than his contemporaries. He is, moreover, depicted in ancient imagery as a man with a prominent brow, nose, and jaw (symptoms of acromegaly). His thumb was said to be so large that he wore his wife's bracelet as a ring for it. According to Historia Augusta, "he was of such size, so Cordus reports, that men said he was eight-foot, six inches (c. 2.6 metres) in height". It is very likely however that this is one of the many exaggerations in the Historia Augusta, and is immediately suspect due to its citation of "Cordus", one of the several fictitious authorities the work cites. ^ Wasson, Donald L. "Maximinus Thrax". Ancient History Encyclopedia. Ancient History Encyclopedia Limited. Retrieved 20 March 2017. ^ In Classical Latin, Maximinus' name would be inscribed as GAIVS IVLIVS VERVS MAXIMINVS AVGVSTVS. ^ Kerrigan, Michael (2016). The Untold History of the Roman Emperors. Cavendish Square. p. 248. ISBN 9781502619112. Retrieved 19 March 2019. ^ Shaw (1984), p. 36. ^ Eusebius. "Church History". Book 6, Chapter 28. New Advent. Retrieved 25 April 2014. ^ Papandrea, James L. (January 23, 2012). Reading the Early Church Fathers: From the Didache to Nicaea. Paulist Press. ISBN 978-0809147519. ^ Graeme Clark, "Third-Century Christianity", in the Cambridge Ancient History 2nd ed., volume 12: The Crisis of Empire, A.D. 193–337, ed. Alan K. Bowman, Peter Garnsey, and Averil Cameron (New York: Cambridge University Press, 2005), p. 623. ^ "Historia Augusta • The Two Maximini". Penelope.uchicago.edu. Retrieved 2014-04-22. Shaw, Brent D. (November 1984). "Bandits in the Roman Empire". Past & Present. Oxford: Oxford University Press (105): 3–52. JSTOR 650544. A. Bellezza: Massimino il Trace, Geneva 1964. Henning Börm: Die Herrschaft des Kaisers Maximinus Thrax und das Sechskaiserjahr 238. Der Beginn der Reichskrise?, in: Gymnasium 115, 2008. Jan Burian: Maximinus Thrax. Sein Bild bei Herodian und in der Historia Augusta, in: Philologus 132, 1988. Lukas de Blois: The onset of crisis in the first half of the third century A.D., in: K.-P. Johne et al. (eds. ), Deleto paene imperio Romano, Stuttgart 2006. Karlheinz Dietz: Senatus contra principem. Untersuchungen zur senatorischen Opposition gegen Kaiser Maximinus Thrax, Munich 1980. Frank Kolb: Der Aufstand der Provinz Africa Proconsularis im Jahr 238 n. Chr. : die wirtschaftlichen und sozialen Hintergründe, in: Historia 26, 1977. Adolf Lippold: Kommentar zur Vita Maximini Dua der Historia Augusta, Bonn 1991. X. Loriot: Les premières années de la grande crise du IIIe siècle: De l'avènement de Maximin le Thrace (235) à la mort de Gordien III (244), in: ANRW II/2, 1975. Wikimedia Commons has media related to Maximinus Thrax. "Caius Julius Verus Maximinus Thrax" . Catholic Encyclopedia. 1913. "Maximin" . The American Cyclopædia. 1879.